Without bees to do their pollination, you would have no flowers, vegetables or fruit on your trees. The best pollinator of all is the Orchard Mason Bee. Unlike the honey bee, this docile pollinator will not sting humans. They live in small holes (not hives). 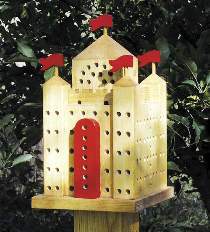 This bee castle provides dozens of nesting holes to attract the friendly orchard mason bee. Plans drawn FULL SIZE. Measures 7"W x 13"H.